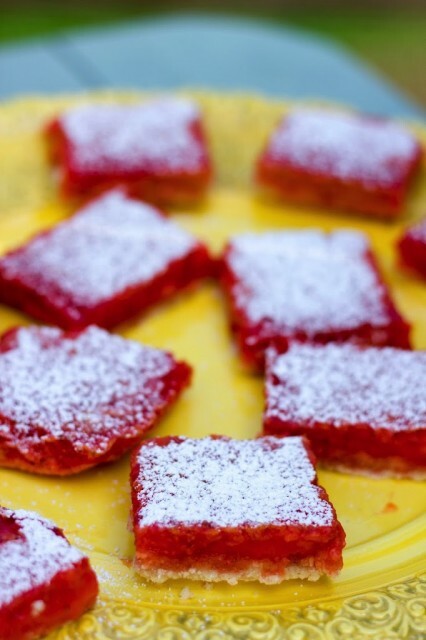 I didn’t remember until I started writing this post, but the very first recipe I posted on this blog was Raspberry Lemonade Bars. I guess my tastes haven’t changed much in the last 2 years…still a huge citrus fan =). (Side note: whoa! Has it really been 2+ years?!? Time flies – especially when you’re having fun! 😉 ) I whipped these up last Sunday afternoon for finger foods at church. I was having trouble deciding on something to bake when I stumbled across this recipe for strawberry lemonade bars. I didn’t need to look any further and headed straight to the kitchen! I had to rush mine up a bit by cooling them in the freezer, but they’re even better if you can wait until they have been chilling in the fridge for several hours or overnight. Enjoy! 1. Preheat oven to 350 degrees and lightly grease a 9×13-inch baking pan. 2. Begin by making the crust. In a large bowl, cream together sugar and butter, until smooth and fluffy. Working at a low speed, gradually beat in flour and salt until mixture is crumbly. Pour into prepared pan and press into an even layer. Bake for about 17 minutes, until set at the edges. 3. While the crust bakes, prepare the filling. In the bowl of a food processor, combine lemon juice, lemon zest, strawberry puree, sugar and eggs and process until smooth. 4. Add in flour, baking powder and salt, then pulse until smooth. Gently pour the filling over the hot crust when it has finished baking. 5. Return pan to oven and bake for 23-26 minutes, until the filling is set . Cool completely before slicing and use a damp knife to ensure clean slices. Dust with powdered sugar, if desired. Store bars in the refrigerator, especially on a hot day.